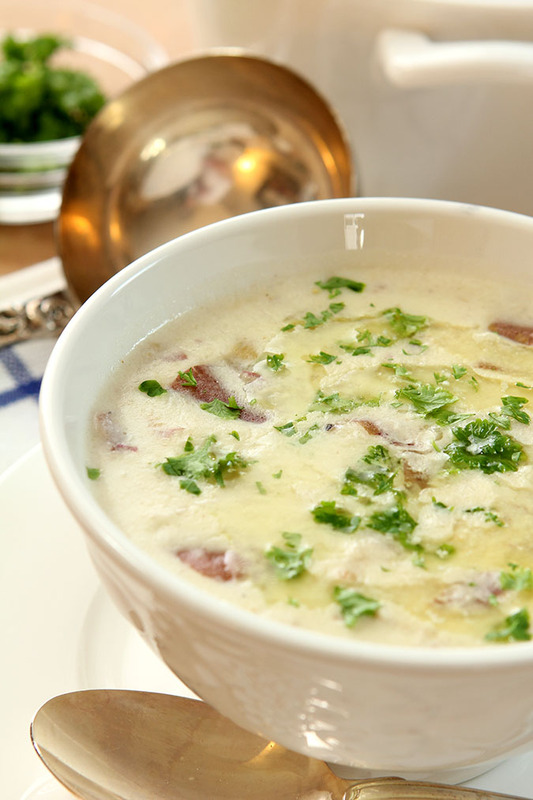 The perfect indulgence, this Bacon, Potato and Leek Soup with Roasted Garlic is rich, delicious and satisfying all year long. While I’m starting to see talk of spring from friends in different parts of the country; it is still winter here in Colorado. Not the bitter cold of December and January thankfully but it was 33 degrees outside this morning and we are far from out of the woods when it comes to a spring snowstorm. So while talk of tulips and forsythia dominate elsewhere I’m still thinking soups and stews! When my friends at The Food Network decided the theme for this week’s #ComfortFoodFeast should be bacon, I decided it would have to be in a soup. This Bacon, Potato and Leek Soup with Roasted Garlic sure hit the spot and I’ve even got a few suggestions for making it super easy. I knew I wanted to include Roasted Garlic so when I noticed that the condiment bar at Sprouts included already roasted garlic I bought enough for this soup. The price per pound for those condiments is rather high but for roasted garlic I thought a great deal…they don’t weigh much! Considering I didn’t have to run my oven for the better part of an hour for those three garlic heads I think I saved by only paying $2 for the finished product. My other hack? Trader Joe’s is new to our area, just opening last year in two locations. Neither one of them are particularly close to me so I don’t go often and when I do I have a tendency to head for the large chocolate bars I use for baking, grab some whole grain mustard I love and then head out. Luckily I had a more experienced friend with me that day last week and she illuminated me on a couple of her favorites including cleaned and sliced frozen leeks. Yes, I do feel a bit like Aunt Sandy with my Semi-Homemade thing going on but sometimes it just works. As much as I love leeks; they are always packaged in a quantity that is more than I need and I’ve lost some of them to my forgetfulness. Frozen works perfectly…and Amy and I thought the price about the same as the fresh product so a nice thing to have on hand in the freezer right? I did use some AMAZING homemade ghee that my friend Ansh had brought over one day when she was here for a visit. That stuff is so addictive. It’s really clarified butter but in a BIG quantity and I savored that stuff like gold. While it adds such a nice touch to foods; it’s not imperative so just substitute butter if you’re not up to making ghee. But at some point make it…chicken fried in ghee must be what is served in Heaven; it is sublime. I’m looking forward to spring and while I will be insanely jealous of those of you who are actually seeing it a month sooner than me; I will sit back and enjoy this delicious soup and soothe my ‘it’s not spring here yet’ sorrow. Trust me, it helps! Preheat oven to 400F. Trim about 1/2-inch off the top of the head of garlic, exposing all the cloves inside and drizzle with olive oil. Wrap the heads in foil and bake for 40-45 minutes, or until cloves are soft. When done, remove foil and set aside to cool. When cool enough to handle simply put some pressure on the cloves and they will slide out. 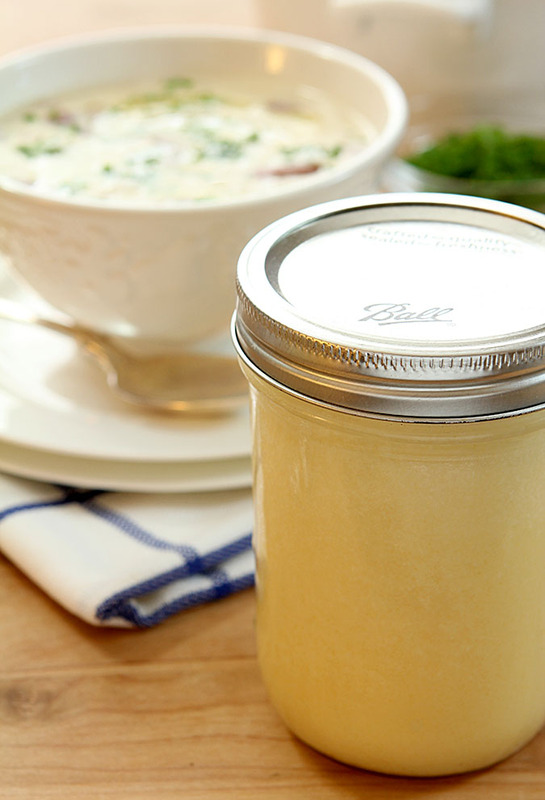 Heat a 2­-quart pot over medium heat and add the butter (or ghee) and olive oil to the pot and stir until melted. Add the sliced leeks and potatoes and cook, stirring occasionally, until the vegetables have begun to soften and brown slightly, about 6-8 minutes. Add the chicken stock, white wine, diced garlic, thyme, and a generous pinch of salt and pepper. Stir to combine, scraping up any stuck bits from the bottom of the pan. Bring mixture to a boil, and then turn heat down to a bubbling simmer. Cook until potatoes are tender, about 20-25 minutes. When the potatoes are tender, remove a couple of cups of the potatoes (see notes) and puree the remainder of the soup using an immersion blender or a regular blender (in batches) and return it back to the pot. Add the bacon, sour cream, and half and half and season with salt and black pepper. Warm on medium heat for five minutes and serve garnished with a drizzle of olive oil and chopped parsley. You can choose to blend all of the soup; I just like to remove a couple of cups of the potatoes and blend the rest to keep some texture in the soup. Your call. When do I add the roasted garlic? Is it a topping? It’s in Step Three Penny; added with the chicken stock, white wine and thyme. This soup was absolutely delicious! Scrumptious!!!!!!!!!!!!!! I made home made rosemary crackers, doing double duty while roasting the garlic. Did a few heads for later and put the rest of the leeks in the freezer. I absolutely love this soup! My family raved about it. And thank you Angela; it is so sweet that you shared how much your family enjoyed this soup; now I think I need to make a new pot of it too! Did the recipie in this post get removed?? Or am I just extra blind today? I doubt it’s you Ashley! I had an issue with the Notes not displaying so I know that folks were working with the software for the recipe area and it might not have been displaying. I’m seeing it now in both Firefox and Chrome; want to try again? Thanks for the heads up! This was amazing!!! I didn’t have while garlic so I just toasted some minced garlic in the pan prior. I had tons of leek so I added up extra stockended up with much more than the recipe stated. I didn’t mind! This was delicious and I can’t imagine how much better it would be with the roasted garlic! Music to my ears…so glad you loved it too Gilly and thanks for letting me know! So glad to hear you liked it too Sandy! I just said in a post I did today…changing up things is what makes it fun and whatever works for each cook is meant to be. 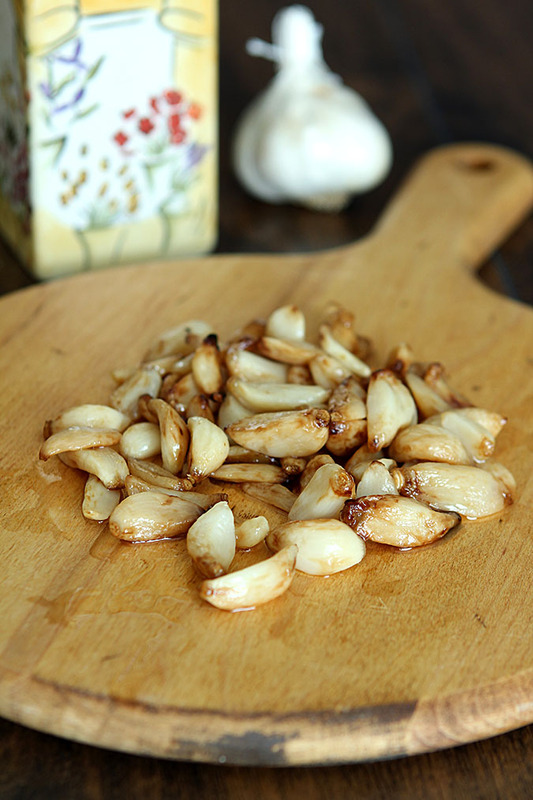 I still love that Sprouts has roasted garlic I can pick up but I’ll do the same in a pinch for time; roasting it is a luxury but I love garlic and would have added it without the roasting too. The frozen leeks? That’s a real luxury…you know how far TJ’s is from me! I REALLY wanted to make this soup, as it looks fantastic! In fact, I’m halfway through the process. However, I have read the recipe over and over, and I cannot reconcile the stock in the ingredients list with the directions. How many cups of stock should be used in this soup? I am going to eyeball it 🙂 I just thought you may have a typo here that you’d want to fix. Well…I sure messed up didn’t I? I looked at the directions and the other quantities and quite honestly wonder myself which was correct Lisa! So I averaged…I said 2 cups in the ingredients and 6 in the instructions and I’m thinking it should have been more like 4 cups? I hate it when this happens because it was long enough ago that I honestly can’t say without making it again. So…how much did you end up using? I might have to go with your number!